What a great read! No, seriously, this was how you tell a story: a beginning, a middle (oh, good Lord, what a marvelous middle), and an ending! Heroes doing heroic things, the "big bad" doing, well, bad things, and all of this held together by some of Chris Claremont's most solid of writings and some of the trippiest, yet tightly solid art by Bill Sienkiewicz!The only smear in the book, and I shouldn't call it a smear so much as a disappointment, was the inclusion of X-FORCE (1991): #99. I respect why they did it, as the book was to encompass all the appearances of the Demon Bear through the team's books. However, I, for one, could have done with out it.The writing by John Francis Moore was okay. It may have been really good, but what killed it for me was the art by Jim Cheung. I am something of an admirer of his style, but here it was just rubbish. The team looked too cartoon-y, while the Demon Bear was not scary in the least!But, as much of the disappointment as that inclusion, X-Force (2008) #s 7-10, as excerpts, was what helped keep the book together. From Craig Kyle and Christopher Yost's tense, edgy characterization to just the overall flavor. C'mon, it's X-FORCE, written by Laura Kinney's (X-23) "papas"! Sure, it was gonna be good!If you are looking for some exciting X-store, without all the mess that is currently in the X-Universe, this one would be your best best! But don't take my word for it (thanks, LeVar Burton! ), read for yourself and experience what I did.. The first/original Demon Bear story was by far my favorite. Could have done without the others. Read in preparation for the New Mutants movie. A good reminder of how much comics have changed, while still going back to the same wells. Good read It was great how this story moved thru the various incarnations of the X teams. Each Era with the bear was different but the action was good. This was an interesting book. 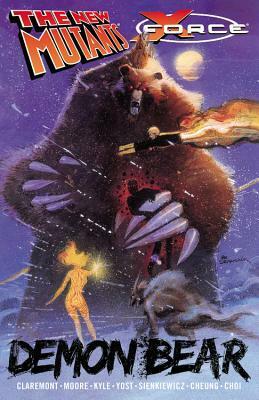 It focused mainly on a Native American character, Danielle Moonstar and her spiritual battles manifesting into physical and mental battles with the eponymous Demon Bear. It collects a couple New Mutants issues from 1983 and X-Force issues from 1991 and 2008. So it feels a little disjointed but Doctor Who dealt similarly with minor village, bringing them back decades apart. The highlight for me was the art of Bill Sienkiewicz, which was highly reminiscent of Ralph Steadman's work (Fear and Loathing in Las Vegas). I always enjoy seeing minorities get time to shine in comics, but it walks a fine line between reverence and cheesiness/borderline racism for Native Americans. An interesting footnote in the greater X-Men canon. I read this exclusively because of its high regard by the hosts of Rachel and Miles X-Plain the X-Men, a weekly podcast I very much enjoy... The New Mutants issues in this TP were spot-on, some classic team storytelling accenting Dani's awful history and team dynamics as Illyana, Sam, Rhane, Bobby and Amara learn about their abilities and loyalties. An added bonus was the introduction of separate stories involving Warlock and Rachel Summers. I definitely enjoyed reading this decades-old issues... on the other hand, the X-Force issues including in this TP left much to be desires when held up to the original story, though I have always loved the art from the late '00s run of X-Force. The original story or totally worth purchasing this whole collection. Three different stories in the book, the original demon bear saga, and two semi-sequels where the bear attacks again. The semi-sequels are worthless, but the original arc has some of the best art of eighties comics, and I don't think Bill Sienkiewitz has done better. It's probably better if you track the older book that collected the saga down, as it does the entire Sienkiewitz run I think, but in a pinch, this one will do for introducing you to an epic (and sadly forgotten) storyline of the eighties mutant books. Ohhhh. A bear. That's a demon. A Demon Bear. Scary. never saw mutants like this !!!! Chris Claremont Bill Sienkiewicz - Chris Claremont is a writer of American comic books, best known for his 16-year (1975-1991) stint on Uncanny X-Men, during which the series became one of the comic book industry's most successful properties.Claremont has written many stories for other publishers including the Star Trek Debt of Honor graphic novel, his creator-owned Sovereign Seven for DC Comics and Aliens vs Predator for Dark Horse Comics. He also wrote a few issues of the series WildC.A.T.s (volume 1, issues #10-13) at Image Comics, which introduced his creator-owned character, Huntsman.Outside of comics, Claremont co-wrote the Chronicles of the Shadow War trilogy, Shadow Moon (1995), Shadow Dawn (1996), and Shadow Star (1999), with George Lucas. This trilogy continues the story of Elora Danan from the movie Willow. In the 1980s, he also wrote a science fiction trilogy about female starship pilot Nicole Shea, consisting of First Flight (1987), Grounded! (1991), and Sundowner (1994). Claremont was also a contributor to the Wild Cards anthology series.